The use of exit strategies will elevate our profits to the highest possible levels. 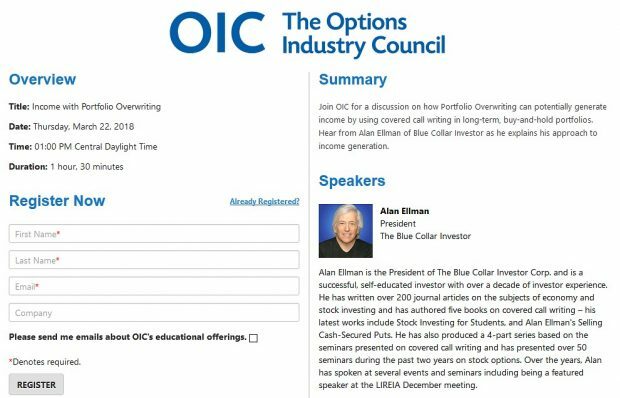 Mastering the skill of position management is one of the main reasons why Blue Collar Investors outperform other covered call writers. A favorite exit strategy of mine is the mid-contract unwind exit strategy used in the first half of an options contract when share price has risen well above the strike sold. In this article I will show a real-life example of a trade I made last year using TAN, an exchange-traded fund that was a top-performer on our Premium Member ETF Report at the time. 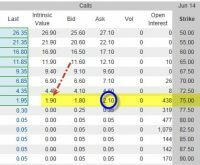 The bid-ask spread was $3.50 – $4.00. I leveraged the Show or Fill Rule to negotiate the cost to buy-to-close down to $3.80 of which $3.66 was intrinsic value ($29.66 – $26). This left $0.14 of time value, the actual cost to close. This is about one half of 1% ($0.14/$26). This means that if we can generate significantly more than .54% with the cash freed up by closing our position ($2600 x 5 =$13,000), it makes sense to move forward with this exit strategy. With 2 weeks remaining until expiration, this goal should be easily achievable. We see that we have generated a 19-day return of 3.60% which annualizes to 70%. 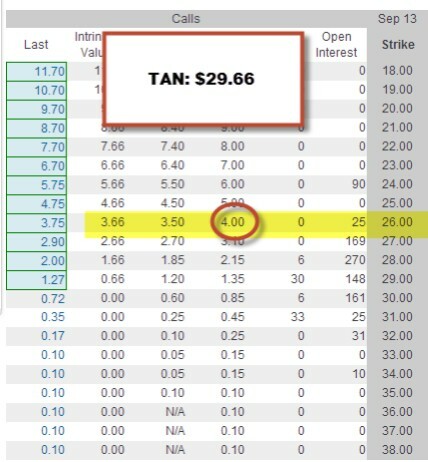 Next we take the $13,000 cash from the sale of TAN and use it in a new covered call position to generate a second income stream. In stage 2 of this exit strategy, our goal (in this case) is to glean a significantly higher return than .54%. All this is thought out in advance of closing the position. If for any reason, we couldn’t generate a return that meets our goal for this second position, using this exit strategy would not make sense. In that unlikely event, we would leave the original position as is and re-evaluate as contract expiration approaches. The use of the mid-contract unwind exit strategy is most appropriate in the first half of the options contract when the time value of the premium approaches zero and the ability to generate a second income stream greater than the cost to close the first one is apparent. Using the “unwind now” tab of the Elite version of the Ellman Calculator will make the process much easier. 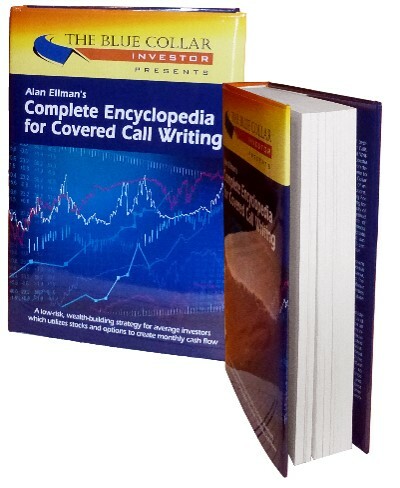 We have had a great many members ask if we would consider publishing the Complete Encyclopedia for Covered Call Writing in hardcover format. I decided to make it available only on this site to our general and premium members (premium members enter the Blue Collar store from the link found in the premium site to get your member discount @ checkout). It will not be available on Amazon.com. My team has created a choice to purchase either the hard or soft cover versions in the Blue Collar store. For the week, the S&P 500 declined by 0.7%, for a year-to-date return of 5.8%, including dividends. BCI: Moderately bullish, selling an equal number of in-the-money and out-of-the-money strikes as we await to see how the Iraq situation plays out. 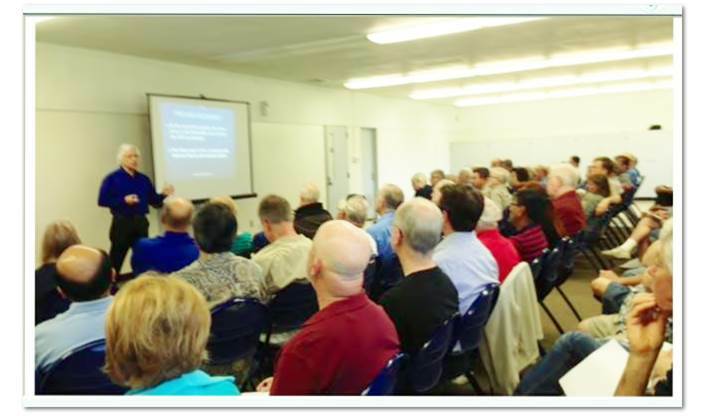 It was wondeful meeting all BCI members who attended my AAII seminar today in Costa Mesa, California. There is nothing more rewarding for a speaker than to have a packed room of interested and motivated investors. I am grateful for your incredible support. CLICK ON IMAGE TO ENLARGE & USE THE BACK ARROW TO RETRN TO THIS BLOG. When evaluating new positions that would make it worth closing an existing deep ITM call, do you look at just current month option expirations, or also at the next month? Many times I have sold calls on positions that have moved considerably into the money and I have looked at carrying out a mid contract unwind. The remaining time value of the option always seems to put me off. I like the way you expressed time value as a percentage. Would you like to set a BCI rule for residual time value percentage? For example if it is less than 0.8% or 1.0% or about 0.5% then consider a MCU. Rules are so easy to follow! I look at the current month when using the mid-contract unwind exit strategy. The reason is that time value erosion of option premiums (theta) is logarithmic, not linear. This means that options premiums devalue more as expiration approaches. In other words, we get little “bang for our buck” by moving to the next month but would be undertaking greater risk with a longer-term obligation. I work the current month until the end. If I can genefrate a 2nd income stream in the current month by closing an entire position at little or no cost and establishing a new position for a 2nd income stream, I don’t hesitate. Otherwise, I wait until or near expiration Friday and evaluate for a possible rolling strategy. I love the strategy and thought process that goes into unwinding a call and the thrill of a profitable exit. I’ve learned, though, to double check the gain I would make if I let the call be assigned. I usually buy positions barely OTM, but occasionally find one that offers a $.70, $1, or $1.50 gain. I always compare the cost/profit of the exit plus the second stream of income to the total profit (premium plus gain) I would have had keeping the call. Seems like an elementary concept, but it’s easy for new options traders (like me) to get caught up in the excitement of the unwind. I had to learn the hard way to remember to compare the two. It’s also easy to forget to factor in all of the commissions/fees we incur moving in and out of these stocks and options. Thank you for all of the tools and information you provide. I’ve learned so much from your site, videos, books and blog! You make an excellent point. Just because we are now “realizing” a profit does not automatically mean that we should unwind. Let me take it a step further…the amount of profit needs to be evaluated in the context of the entire investment so a profit of $1 is significant if the share price purchased was $30 but not if the price was $100. So we must look @ percentages. 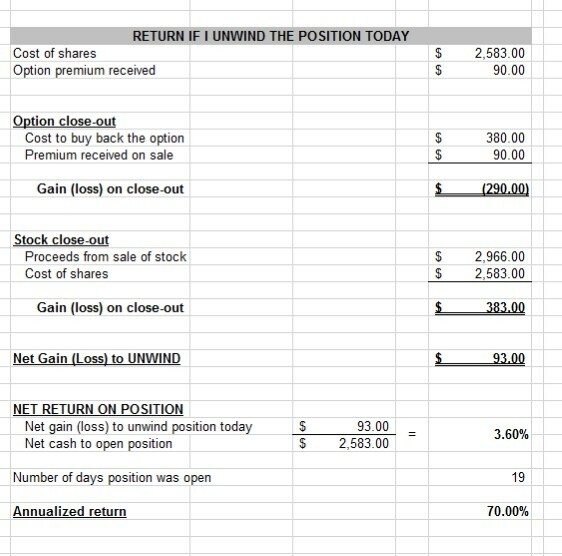 What is the % cost to close versus the % we can generate using the cash in a new position? The key is for the time value to approach zero and that will open a flodgate of opportunities. Once we think in terms of percentages it will be easy for us to determine if the mid-contract unwind exit strategy makes sense. The Weekly Report for 06-13-14 has been uploaded to the Premium Member website and is available for download. Alan, As I have been now comparing the price performance using the RS line, I have a papertraded stock that had a situation where it may have underperformed . The price then went up and peaked on 22nd May at $46.21 to then decline. As its falling I compared the RS line to it, and can see that it breaks the ‘RS support level’ on 30th May, making me think I should maybe sell right then, as it underperforms the market. Yet on this 30th May the price close was at $42.70 – which is above the strike price. How do I determine when I should likely sell in this situation when the stock looks to be underperforming – but is also ITM?, – – do I still need to wait until option value is at 20/10% level, or maybe wait until it reaches my breakeven value? (I am still currently holding this stock too!)? As you know, in the BCI methodology we buy back the option when the price meets our 20%/10% guideline. As you can see in the screenshot I created below, the option price (yellow field) never reached the 20% or 10% threshold (green line). You are doing great comparing the price action of the stock to the overall market and it has underperformed in the past month but is actually out-perfporming the S&P 500 over the past week. 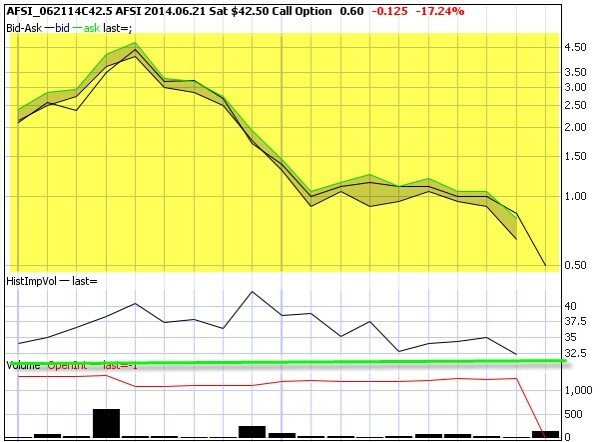 If the share price remains above the $42.50 strike as it is now, you will have maxed your position. Your breakeven is $41.15. If the technicals that you are using for your assessments make you uncomfortable you can unwind tomorrow at a profit. CLICK ON IMAGE TO ENLARGE & USE THE BACK ARROW TO RETURN TO THIS BLOG. I purchased SAP on MAY 21, 2014 for $75.254. Concurrently, I sold the 6/21/2014 call for $75.00 at $1.10. Should I Buy back the call for $1.15-$1.35. and sell the stock for a bigger gain? It almost never pays to buy back an option on a stock that has appreciated and then sell the stock to capture that appreciation. The reason is that the premium you will pay to close consists of intrinsic value (share appreciation) + time value (your cost to close). In other words, you would be losing money, not making money. In the screenshot below (before market opens on Tuesday, June 17th), the cost to close is $2.10. The stock is trading at $76.90, $1.90 above the strike. So here you pay $2.10 to capture $1.90. That said, according to earningswhispers.com, SAP is reporting earnings today before market opens is their projection. Hopefully, that won’t spoil what’s been a successful trade to this point. I have a question regarding a stock that has declined in value over the past week or so. I bought 300 shares of AKRX for $29.20 and sold the 30 call for .75 cents. Now the stock is at $27.72 and the options is worth .10 cents. This stock also has gone into the category of “passed previous week and failed current week” on our premium report – so more than mixed technicals there is now a question regarding this stock. Given this Friday is expiration Friday I am not certain which exit strategy applies. You have lots of stuff on stocks going up and stocks gapping down however I haven’t found much on a gradual decline and/or stocks that have gone down slightly. Obviously I can do nothing and let the option expire worthless however in this example if I sell the stock next Monday or Tuesday (assuming everything is the same) I will lose $220 on the entire trade with AKRX – this really hurts my June results. I can roll down to the Jul 25 strike and show a nice profit however Rolling Down Strategies tend to be used early in the contract cycle not in the last week – if I understand this exit strategy correctly. I don’t want to Roll Down just to show a profit – I want to use the correct exit strategy. On or near expiration Friday the strategies are Rolling Out and Rolling Out and Up or do nothing or unwind the position. Am I correct here? Is it ok to Roll Down in this example? If the option expired today, you would have an unrealized share loss of $0.50 and a realized option profit of $0.75 for a 1%, 1-month return. Alan – I have a question for you (just want to confirm my math is correct on this). I have been looking at TSLA as a candidate for a collar trade. Since my maximum loss (i.e. capital at risk) would be $25/share (and that assumes I would exercise the put and sell/realize the loss, and also excludes the receipt of the net credit), would it be accurate to think the ROO on this trade is: $8.06/$25, or 32.2%? As a general rule; when a return appears too good to be true…it usually is. Alan, thanks for confirming my last question, and so I will either wait until the options value is at ‘guideline levels’, or else if chart technicals all breakdown then a possible DMCP is better. – Now as this article is about the MCU strategy, I thought I had better ask you about a recent papertrade I did. This was a 2-month trade, on a Rolling out & up and then a MCU after that. Using the stock ‘THRM’ at 17th Apr(expiry) I did a BTC on the $35C(for Apr) at $1.10, and then STO the May $40C@ 0.45c,- with the stock at $35.85 at April expiry. This stock rose up, and ends the May expiry at $39.79. And then on 6th June price is at $43.36 so I look to do a MCU, with a BTC of the $40C@ $3.90 and then selling the stock. 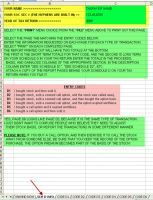 – Now I have my Calculations for this 2-month trade but wonder if you can show me how you worked out the profits/returns, so I can confirm if I am correct? – Also my main confusion here is when the price at May expiry is at $39.79 (under the $40 strike), then wouldn’t this be the next cost-basis amount – after the original $35 that I did a BTC on at the April expiry? (because I had worked out a $4.79 capital gain into my calculation for May)? even though it has shown me good returns lately has also left me a bit confused over the calculations in it. First congratulations on a series of excellent trades. I’ve done well with this one as also. The confusion is understandable because we have 2 sets of calculations…one for making the best investment decision at any point in time (the main reason I developed the Ellman Calculator) and one for P&L and tax purposes. For the former, use the “unwind now” and “mid-contract unwind” tabs of the Elite version of the Ellman Calculator. 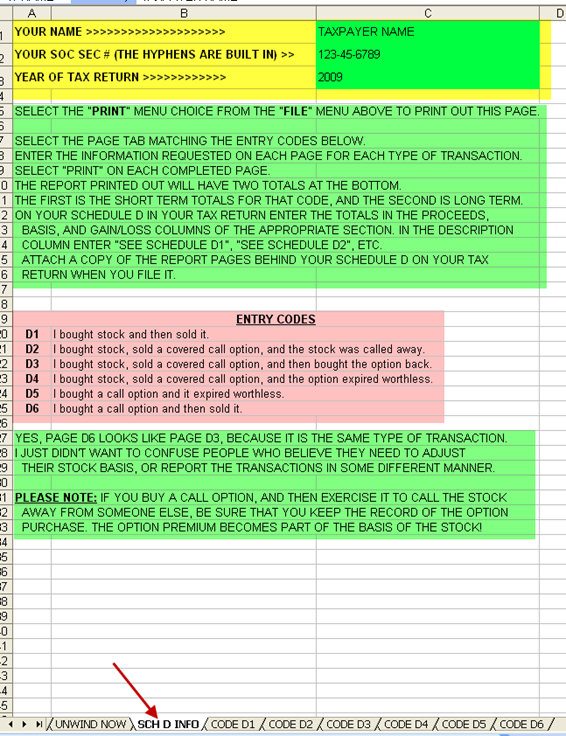 For the latter, use the P&L spreadsheet found in the “resources/downloads” section of the premium site or the Schedule D within the Elite Calculator (as a premium member you have free access to the expanded version of the Ellman Calculator). Use tabs D2, D3 and D4 as shown in the screenshot below. Until the long stock position is closed, you have a series of options trades where you STO then BTC where the acquistion date is later than the sale date. If you want to do a 2-month evaluation of your position, calculate the share profit + option debits + option credits and divide by the cost to purchase for a 2-month return. Mutiply by 6 to annualize. I’ve been doing some ETF options and some paper trades. All successful. Plus I’ve reviewed your exit strategies in your Complete Encyclopedia. Wouldn’t you always want to sell your OTM option when it hits the strike price since your gain is capped, so you can roll up or out? Why not put an automatic sell (Buy to Close) when your OTM reaches the strike price? Is it that easy or am I missing something? While my option goes deeper in the money, only for me to buy back, I miss the gain above the strike price. I haven’t seen this question. Thanks again for doing what you do. Unfortunately, it’s not that easy. Covered call writing is all about generating a monthly cash flow and we are very sensitive about giving back cash realized from option sales. In the trade you described, you generated an initial option return that met your 1-month goal + additional share appreciation from purchase price to strike. Great job so far, you achieved a maximum return on your trade. Now, as the strike goes from OTM to ATM, the time value can actually increase resulting in an options debit. True you are capturing intrinsic value but losing time value, our focus using this strategy. One mistake many cc writers make is to confuse cc writing with other strategy goals. This is not long-term share ownership nor is it dividend capture, it is generating monthly cash flow by selling options and perhaps share appreciation to the strike. Now, I am all for making more than a max return and that’s why I developed the mid-contract unwind exit stratregy (pages 264 – 271 of the Encyclopedia…). In this case, the time to act is when the time value approaches zero as the strike moves deeper ITM. Otherwise, consider a rolling out strategy as expiration Friday approaches. Being a CPA with a gift for math I know you’ll get this.